I never heard a thing about the film Little Boy until surfing through the Flixster app. It looked like it might be uplifting so we decided to go check it out. It was more than uplifting. I cannot recommend this movie enough. It was such a good film! Not only is it a great uplifting story, but it is a good family film too. Watching this, you will believe in miracles! 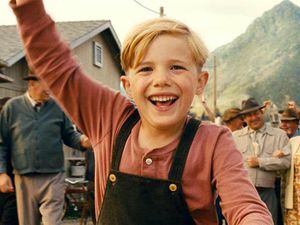 The first film that caused me to cry was Old Yeller as a boy, but tears streamed down my face and I was close to blubbering many times watching Little Boy. I can’t remember crying this much watching a film ever. The 4′ 3″Jakob Salvati who plays the lead role is a big actor that can raise you to the peak of joy when happy and rip your guts out with his despair. Michael Rapaport (who plays his father) has been a favorite of mine for a long time and he doesn’t disappoint in this movie either. I am sure this won’t do great in the box office as it doesn’t have explosions, CGI monsters, superheroes or gravity-defying stunts. For that reason, most will never see it and the general public may even decide it is too cheesy, too simple or too slow, but hey… they say there’s no accounting for taste. I can’t tell you enough – this is such a good film. It is a film that is good for the soul. Go see it and take someone you care about… but keep the tissues handy.